Experimental work on loop antennas in the radio frequency (RF) region reaches back in time to the development of the first radiating structures. Almost immediately differences were identified between loops and linear dipoles, which showed that dipoles were to be much preferred over loops for AM broadcast applications. But with time, loops were found useful for FM at ultra-high frequencies (UHF) and for a few special needs. Unfortunately, loop antennas never attained as wide an acceptance in communications as that enjoyed by structures derived from dipoles. In 1999, loops seem to have a found a place in history. The development of meta-material structures, using small split-rings, suggests that loops may enjoy a renaissance as nano-scaled rings in the Microwave (MW), TeraHertz (THz) and Optical regions. 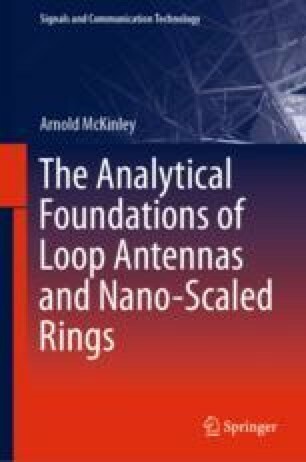 This chapter covers the experimental and analytical history of RF loops and of nano-scaled rings.